James Rode and Sam Musto Chop the $300 Deep Stack Event! James Rode and Sam Musto, nearly dead even in chip, have decided to chop of the remaining prize money in the $300 No-Limit Hold 'em event. They both will take home $17,520 for the effort. 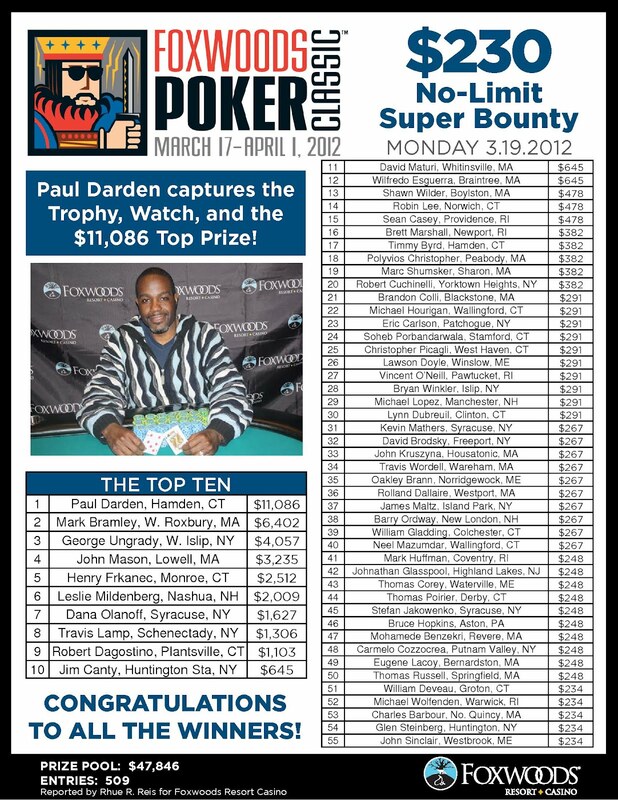 They ran out one hand to determine who would take home the Foxwoods Poker Classic Trophy and watch. Rode won the hand to take home the hardware. The turn is the [Jc] and the river comes the [9c]. Rode's better two pair takes the pot and eliminates St. Hilaire in 3rd place. The board runs out [Qd][Th][6d][4d][Jc] and Zujewski is eliminated in 4th place for $6,532. 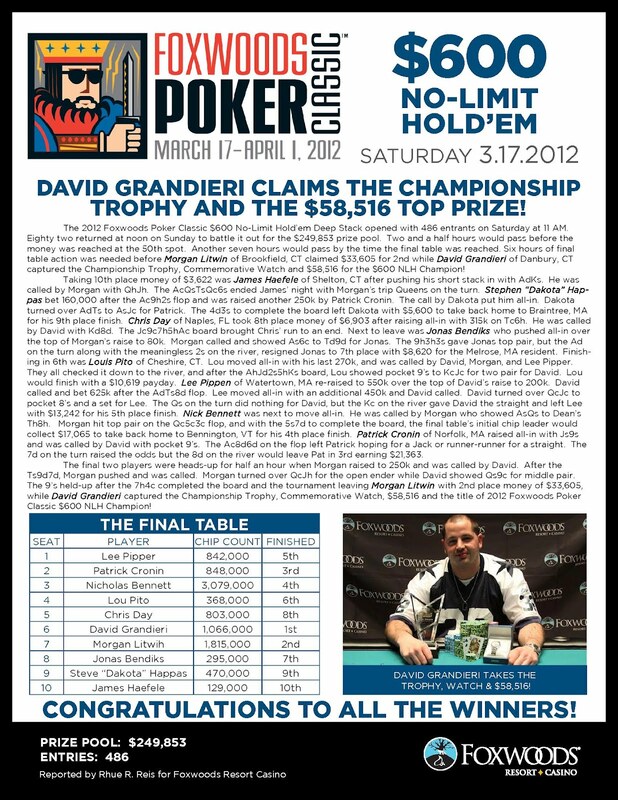 We had a total of 334 players in the $400 No-Limit Hold 'em Deep Stack event at the 2012 Foxwoods Poker Classic. The board comes [Jc][9h][8c][6c][Kc] and St. Hilaire rivers a flush to eliminate Watson in 5th place for $5,085. After being crippled by Sam Musto a few hands earlier, Mike Hudson is all-in on his big blind. James Rode raises before the flop and everyone else folds. They show. The board comes [Kh][Qh][Qd][3d][As] and Hudson is eliminated in 6th place for $4,106. The board runs out [Js][8c][8d][4h][9h] and St. Hilaire drills a nine on the river after Ordway had taken the lead with a four on the turn. Ordway is eliminated in 7th place for $3,460. Sam Musto raises to 80,000 before the flop and Benjamin Berg moves all-in for 320,000. Musto calls and turns over [Kh][Th] to Berg's pocket nines. 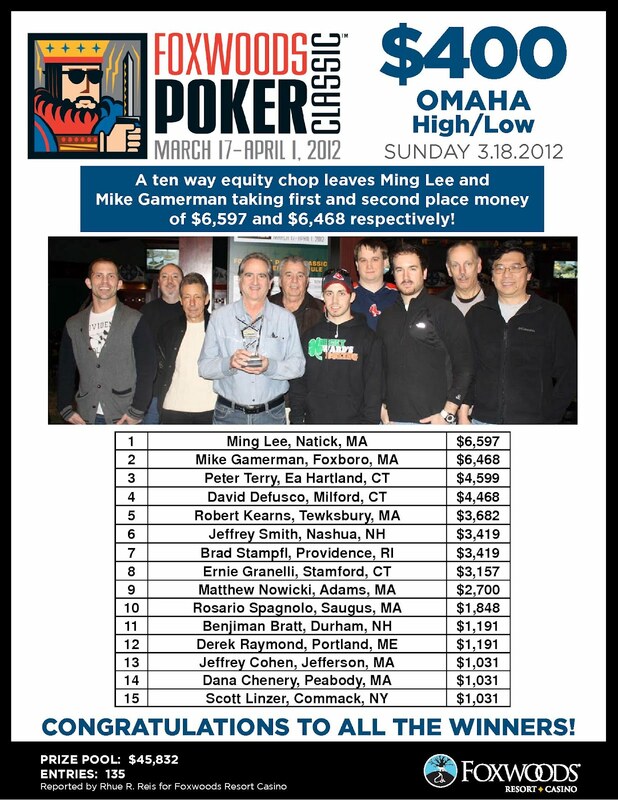 The board runs out [Kc][Qs][6s][7d][8d] and Musto pairs his king to win the pot and eliminate Berg in 8th place for $2,753. The board runs out [Kc][9c][9s][Kh][2s] and the board double pairs, counterfeiting Little's pocket pair. 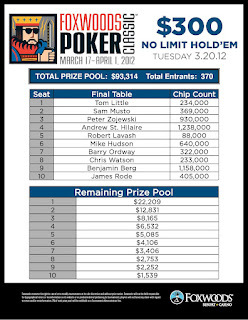 Little has been eliminated in 9th place for $2,252. It is folded around to Rob Lavash on the button, who moves all-in for his last 15,000. Mike Hudson calls the 24,000 big blind and Barry Ordway checks his option. The flop comes [Jd][9d][4c] and both Hudson and Ordway check. The turn is the [5c] and Hudson fires 75,000, inducing a fold from Ordway. The river comes the [7h] and Hudson wins the pot, eliminating Lavash in 10th place for $1,539. $300 Deep Stack Final Table Set to Begin! The final table of the $300 No-Limit Hold 'em Deep Stack event is about to get underway. The blinds are 12,000-24,000 with a 4,000 ante for another 22:20. We are down to the final 10 players in the $300 No-Limit Hold 'em Deep Stack event. 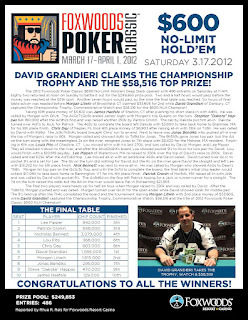 The final table players will return at noon tomorrow and play down to a winner. 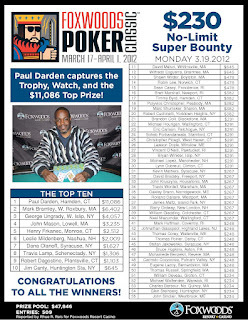 Final chip counts and seat assignments will be posted shortly here on FoxwoodsPoker.com.